North Carolina continues to struggle with too few dollars coming in to serve a growing state that needs good, quality schools, healthy environments, safe neighborhoods and supports for workforce training and economic development. In the final days as policymakers negotiate the differences in their original proposals to arrive at a final budget, relying on bad numbers to try and meet these real needs in an unsustainable manner would be a mistake. One number that talking heads and others have suggested shows the strength of our current tax code (and to some could be used to meet unmet needs) is the $1.2 billion in excess dollars over appropriated expenditures noted in the May 2016 current monthly financial report from the state Controller. This number does not mean that revenue collections for the current fiscal year came in $1.2 billion over state officials’ initial projections. The consensus revenue estimates have that figure at about $330 million. What that $1.2 billion figure reflects is revenue over-collections plus unspent revenue from the prior fiscal year in the current year budget and reverting state funds that were appropriated to state agencies back to the General Fund – all of which has resulted in not spending available revenue for the current fiscal year despite ongoing needs in many areas of the budget and communities across the state. Not only are the majority of these dollars not sustainable sources to meet unmet and important recurring needs, they aren’t all that different from figures we’ve experienced in the past following a downturn. 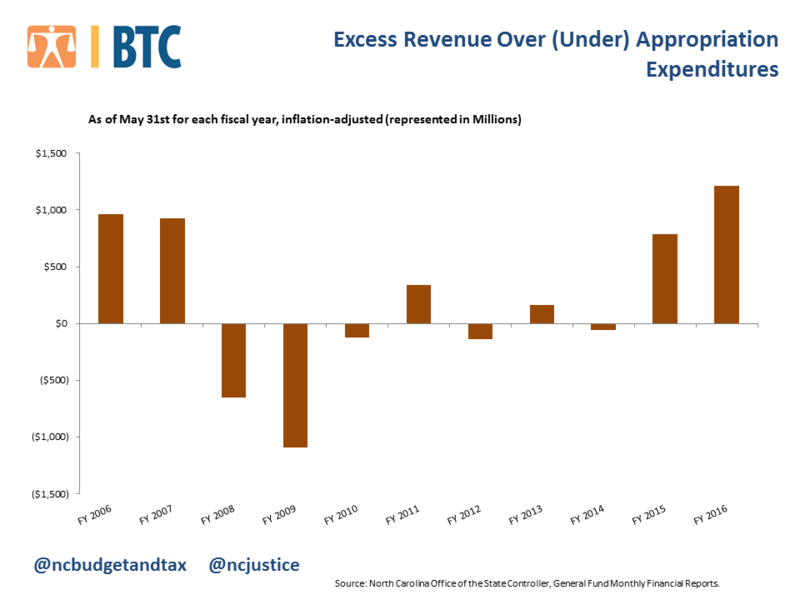 Before the Great Recession, when North Carolina was still in fiscal recovery from the 2001 recession, such excess revenue over appropriations was over $900 million when adjusted for inflation (see chart). The reality is that these dollars fall far short of what is needed to ensure that all North Carolina communities can thrive. Given the potential one-time nature of these dollars, they shouldn’t be used to provide all teachers and state employees a raise, provide retirees with cost of living adjustments and ensure healthcare services for the elderly and poor. Instead, North Carolina needs to re-examine the income tax cuts that lawmakers have already passed and make sure that further flexibility is available to make sure communities can thrive and aren’t hampered by unnecessary and arbitrarily low tax caps in the state Constitution. The $1.5 billion that already has been foregone with the low income tax rates could have been used to get teacher pay to the national average, reduce waitlists for early childhood programs, make a college education more affordable and help ensure safe and healthy communities. No, North Carolina does not have a $1.2 billion revenue surplus. And no, this excess revenue does not mean we have enough resources to ensure that all communities can thrive. It is time to realize that the math won’t work under a tax-cutting regime when we aspire to grow and thrive.